I think we can all agree on certain facts of the case. We all know Humpty Dumpty was sitting on top of the wall. We've all seen the pictures many times. And we've also seen uncounted times the pictures of Humpty at the bottom of the wall. As gruesome as those are, we can't help but stare at them. What happened next is also generally agreed upon. An undetermined number of the king's men and the king's horses (I'm not buying that it was all of them) showed up. And despite their best efforts or maybe because of them, Mr. Dumpty could not be saved and unfortunately expired at the scene. Now, one can reasonably ask the question, what kind of pathetic and disgraceful health care system did this kingdom have, if the EMS crew consisted of the palace guards and their horses? And we think we have problems. But let's not allow our attention to be diverted from the most important question in this case. 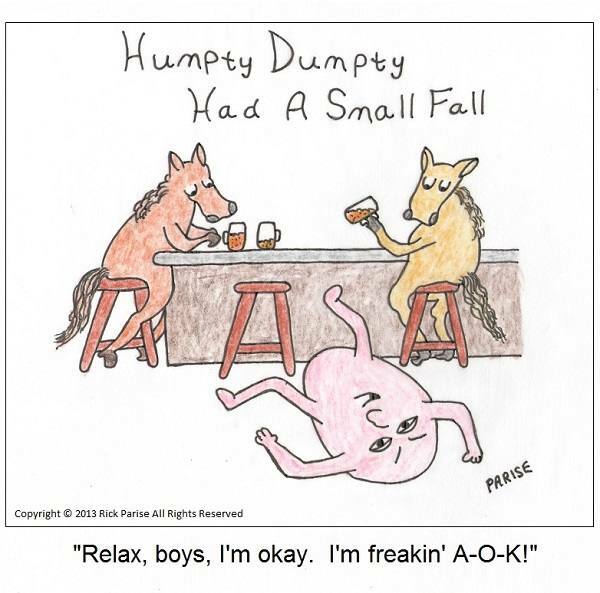 How did Humpty end up at the bottom of that wall? Did he slip? Did he jump? Or was he pushed? If someone did push him, then who? And what about motive? Who could possibly have it in for him? Wasn't he just a lovable, inedible egg? The evidence that he had a wife or a girlfriend is sketchy at best. Also, did he leave a will? We've never heard anything about that. Usually with murder, love or money or both are involved. The sad fact is we will probably never know what really happened. Only one thing is certain: life is messy. And all too often so is death.